Samuel Armenteros put up quite the celebration after his second half goal. Every team's schedule is full of trap matches, and you could excuse the Portland Timbers if they looked at their May 19 date with the Los Angeles Football Club as one of these. 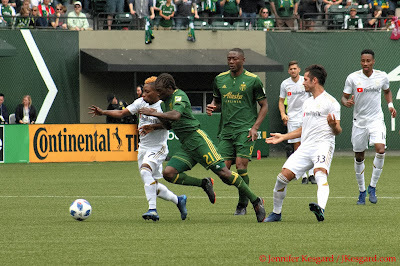 After an emotionally draining victory over their fierce rivals from the North, the Seattle Sounders FC, on May 13 that wasn't decided until late, Portland didn't get much time to rest on any laurels with LAFC visiting and a national audience on FOX awaiting the early afternoon kick. The Timbers had some issues finding their offensive rhythm until they struck in the second half, but LAFC made it interesting by leveling the match minutes later. 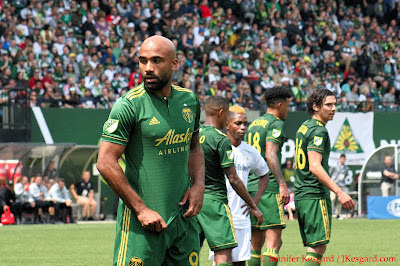 It was then when Timbers Coach Gio Savarese brought on Samuel Armenteros for a late push, and Armenteros added his name to a rather unique club when he tallied his first ever MLS goal while the Timbers Army was singing "You Are My Sunshine". The "sunshine goal" was enough to push Portland to an impressive 2 to 1 victory for their fifth win in a row, but as with anything during this current streak, it wasn't easy and it had plenty of challenges. 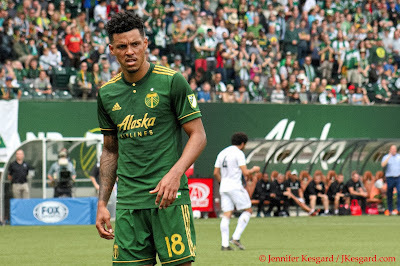 Rivalry matches always have plenty of emotion and spite to them, and while many of the cast of characters were different from previous iterations, you could tell the Timbers were exhausted after dealing with them for 90 minutes. Expansion sides bring in their own level of difficulties when facing them for the first time, especially in terms of the unknown; expansion clubs bring in a mix of MLS veterans looking to continue their career in a new stop, unproven MLS talent who didn't establish themselves with their former team due to injuries or competition, talent acquired through draft or free agency, and bringing over other skilled players to build around. LAFC have an intriguing mix of speed throughout their roster, combined with long time veterans like Benny Feilhaber, Walker Zimmermann, Jordan Harvey, Laurent Ciman and Steven Beitashour filling key roles. LAFC found former USMNT manager Bob Bradley to coach their side, and Bradley added international coaching experience to his resume after being relieved of USMNT duties back in 2011 before Bradley coached several MLS sides in previous years. Like many expansion clubs (think Portland Timbers in 2011), when they are good, they are very good, and when it's bad, it's really, really bad; LAFC came into the match sitting in second place in the MLS Western Conference with 20 points on 6 wins, 2 draws and 2 losses with some impressive wins and even more entertaining failures. There is plenty to build around in LAFC with Carlos Vela, and the franchise itself has been very strong in getting a new stadium, solid TV and sponsorship deals and cultivating a burgeoning supporters' group. Diego Chara was very busy all afternoon dealing with challenges. Bradley made the decision to start fleet footed Diego Rossi with Vela and SKC castoff Latif Blessing to interject some pace in their attack, but at the same token, Bradley picked several extremely physical players - Feilhaber, Ciman, Harvey, Beitashour, Zimmerman - and that led to a very difficult approach for the Timbers to deal with. There was pace all over the place, but in getting used to that, there was plenty of extra curricular activities that occurred all over the pitch, from flying elbows to excessive tackles to hard challenges and plenty of talking. Center Official Drew Fischer decided to let the sides play for the most part, but he did end up issuing 6 cautions on the day once it was all said and done. The biggest issue with Fischer's officiating was the lack of consistency within various calls, and in one case in the first half, Diego Chara received a caution for a foul on Feilhaber while he was being elbowed in the process. Since none of the fouls were considered clear and obvious errors, VAR wasn't consulted in any instance, but in retrospect, I found the match as one of the worst officiated affairs in some time. I can understand the judgement in certain instances where an official might not see something because of the angle or actions taken, but by the same token, Fischer's approach essentially meant that nobody was sure what would be called once the whistle blew. With all of the distractions going on after the emotional match versus the Flounders, Savarese chose not to mess with success in using the same starting eleven that faced Seattle: Jeff Attinella in goal, Zarek Valentin, Liam Ridgewell, Larrys Mabiala and Alvas Powell on defense, Cristhian Paredes, Diego Chara and Andy Polo as the defensive midfielders, Diego Valeri and Sebastian Blanco as the attacking midfielders and Fanendo Adi as the lone striker. The approach would bring Polo and Paredes back to aid the defense when countered against, but otherwise, Polo would push forward to aid Valeri and Blanco to support Adi on offense. The approach has yielded some of the best offensive soccer for Portland this year, but there have been struggles at points when teams try and alter the pace with extreme physicality or packing the defensive line - Seattle played 10 men behind the ball at all points in an attempt to stall and frustrate the Timbers. 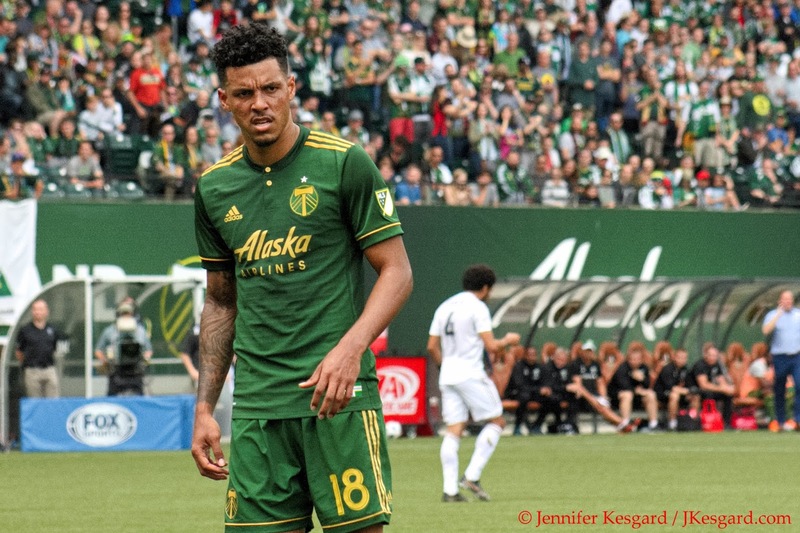 Savarese couldn't have been very happy when 6 minutes into the match, Ridgewell was taken down on a hard tackle and had to leave because of injury, thus allowing Julio Cascante to make his home and MLS debut for the Timbers. Cascante didn't miss a beat, however, and his inclusion was seamless within the defensive approach for Portland. The first 45 minutes did provide some interesting observations outside of the Ridgewell/Cascante switch, as Adi got the best early chance for Portland off a through ball with the LAFC defense caught flat footed. Adi's shot struck the post, however, and Powell couldn't do anything with the rebound, but Adi, Cascante, Mabiala and Valeri all had quality shot attempts in the following minutes. Blanco, meanwhile, was pulled down hard by LAFC midfielder Mark-Anthony Kaye by the shirt in the 20th minute and was down for several minutes, while Beitashour was carded seconds later off a corner kick elbowing Adi in the head. The back and forth movement and crashing continued for the rest of the first half with Chara getting booked just before first half stoppage against Feilhaber, yet Fischer had spent several times talking with Benny about his various bumps and challenges. While the match being scoreless wasn't a huge surprise, it was slightly frustrating for the home side considering the advantages in shots and quality chances. The only downside that could possibly be argued with is time of possession as LAFC had a decidedly huge advantage there (60 percent to 40 percent), but one of Savarese's key tenets this year is that possession isn't really necessary in order to be dangerous and attack minded. Another surprising fact for me is that Paredes continued to start the second half, as the young midfielder was leveled in first half stoppage and spent several minutes on the turf. When he arose, he walked gingerly to the side pitch without Fischer making any call about the contact. Tensions were still flowing as the second half started but the Timbers were able to jump out ahead in the 51st minute. Cascante had played a ball forward for Blanco, who was dropped for a hard tackle outside the box about 20 yards from goal, giving Valeri the green light to put in on frame. While LAFC goalkeeper Tyler Miller made the initial free kick save, he spilled the ball to the right where Paredes was waiting clear of defenders. The midfielder tapped it easily into goal to put the home side up to start the celebration. The happy thoughts were short lived when Kaye leveled Chara at midpitch after the restart, and Valentin received a caution for defending his teammate and getting in Kaye's face about the foul. While Kaye also got booked, the intensity was escalating the contact for both groups. 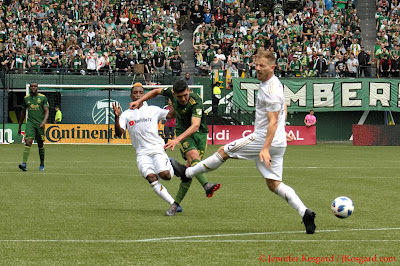 The volleying continued as the substitutes started taking the pitch, and LAFC was able to take advantage of a slight lapse when Vela was played into space on the right in the 74th minute as the Timbers were trying to find marks. Vela has a history of making quality distance goals, and this one was no exception as he timed and placed it perfectly to slide past Attinella into the left corner of goal to level the score. Savarese made his last two moves to bring on Armenteros for Adi and Andres Flores for Polo to change up the attack, and the updates did pay off eventually in the 81st minute. The Timbers Army talk greatly about the history of the "Sunshine Goal" which started during the USL era when a Timbers player would score while the Army was singing their signature song, "You Are My Sunshine" in honor and inspired by Timber Jim, the team's former lumberman and now ambassador of love. I have borne witness to the 3 previous goals that were scored like this - my favorite might be the 2010 Ryan Pore effort that secured a win in the Timbers' last USL era match - but this goal might rival it. Paredes played a spectacular outlet after LAFC had countered to relieve Portland's pressure on 2 consecutive corners to Armenteros, and the striker launched a crazy shot into the left corner of goal to beat Miller. He celebrated this tally by running off the pitch and up the stars to the main Timbers Army capo stand to celebrate with the fans, hugging several of them in the process. It was a wonderful, emotional moment that has been recounted in several videos online, but Fischer spoiled the moment in carding Armenteros for excessive celebration. Both sides continued to press for more, and Flores had a completely open net to shoot at in stoppage time to add an extra goal, but he scuffed the shot as Paredes took another shot at the final whistle. Bradley was complaining vociferously after the match was over, and Savarese was trying to calm him down afterwards. For the first match between sides without much history, there was certainly a lot of venom displayed. To their credit, Portland played smart and measured football and took advantage of situations where they could. Even with the extremely physical play, the Timbers kept their heads and avoided being drawn into extra discipline or escalating actions, yet they also stepped up to aid their teammates when needed. Defensively, the team was very strong and organized, especially with the changeover due to Ridgewell's injury and Attinella is playing with such confidence and poise right now. If there is a bigger trap game in their future, however, it might be this weekend - as the Timbers travel to Colorado to play the Rapids on May 26. The Rapids are again struggling to find their purpose, but Portland traditionally struggles playing there for whatever reason, but at this point. there shouldn't be too many reasons why Portland can't extend the streak to 6. We'll see if they are able to pull this off, but right now, I wouldn't count against them.